Number of pages: 369 p.
Against all odds, Adele must escape from the Pen and find her family, while being hunted. She is helped by two other inmates, Tawni and Cole, each of whom have dark secrets that are better left undiscovered. To be honest this is one of the harder reviews to write since I am not really sure why I liked this book, I remember it but I can't really put a finger on why I liked it. Looking at it from writer's point of view, this book contains a lot of world building. Which ofcourse is important if you are shaping a dystopian world. But this made the first quarter of the book a little slow, a lot has been explained about the Tri-Realms. Also we learn a little bit about Tristan and Adele background. After that the real fun started, when Adele and her new friends Tawni and Cole escape from prison. From that part the story takes you across the Moon Realm, lots of actions which was really well described. I really liked the detailed fighting scenes and I loved the way David described the fighting scenes! You know what? I don't usually compare books in the genre with each other but I liked this much more than Matched. Why compare it to Matched? Well they both have major world building going on in their books. But David combined this with a lot of action, which I felt Matched was lacking in that department. So that is why I liked this much better than Matched, especially the wicked ending! Which is probably my favourite part of the book. It is the ending that turned this from a three star read into a four star read! Splendidly done! *bows to David* So therefore 4 skaters!!!!! I'm so glad that you loved this book! Yes, this books is action-packed, which I did love, too :) I hope you continue reading the rest of the books. 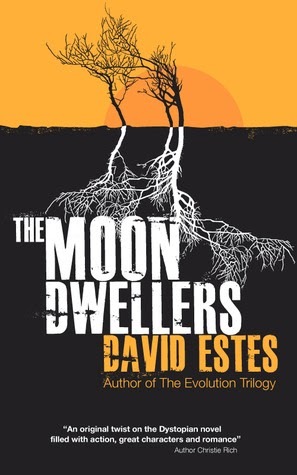 Btw, you can join my David Estes contest, to get the rest!